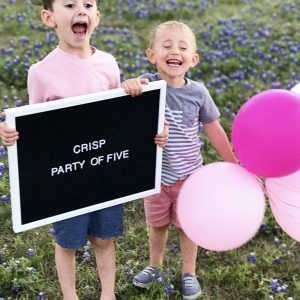 And if you are here from Jessica’s blog, Patina Gray, welcome! Didn’t you love her pretty post? 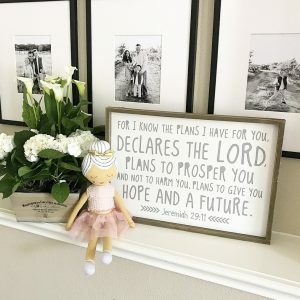 It’s always fun to be a part of these blog hops and see how other people around the country decorate their homes for Fall! It’s like a virtual home tour! Thank you to my sweet friend Lindsay at Aratari at Home for putting this group together! You are the best! You can find everyone’s beautiful fall inspo linked at the bottom of this post. 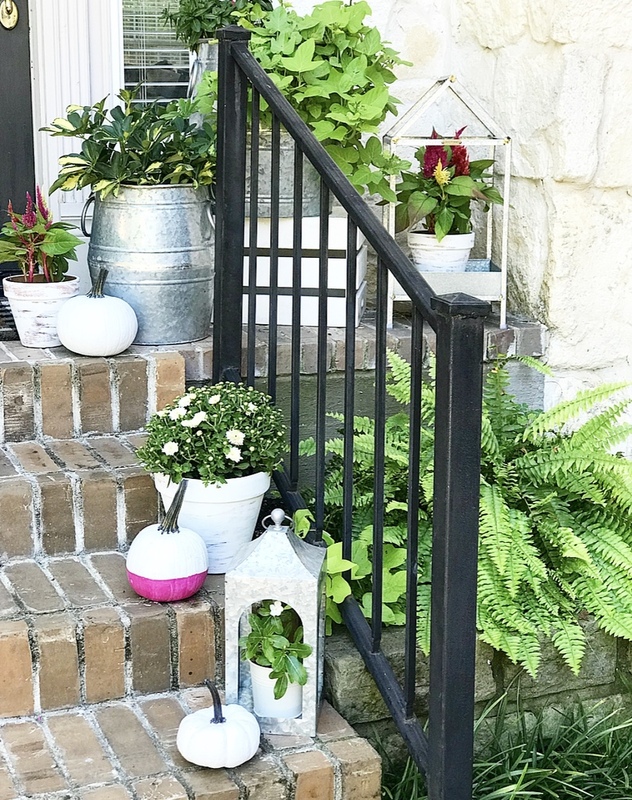 Today I’m sharing our Fall porch and the little nook you see when you first enter our home. A drab door color, overgrown, dying evergreens and minimal porch decor just made for a really sad entrance. This is not how I wanted to welcome people to our home! It’s amazing the difference a few plants and a little paint can make! I shared this transformation here. 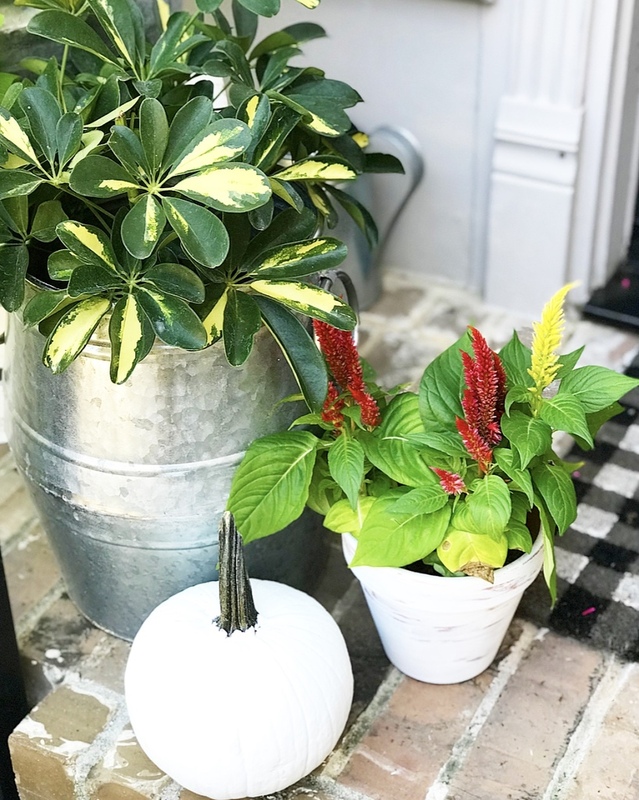 If you are wanting to perk up your porch for fall, here are a few easy ways to welcome the season! 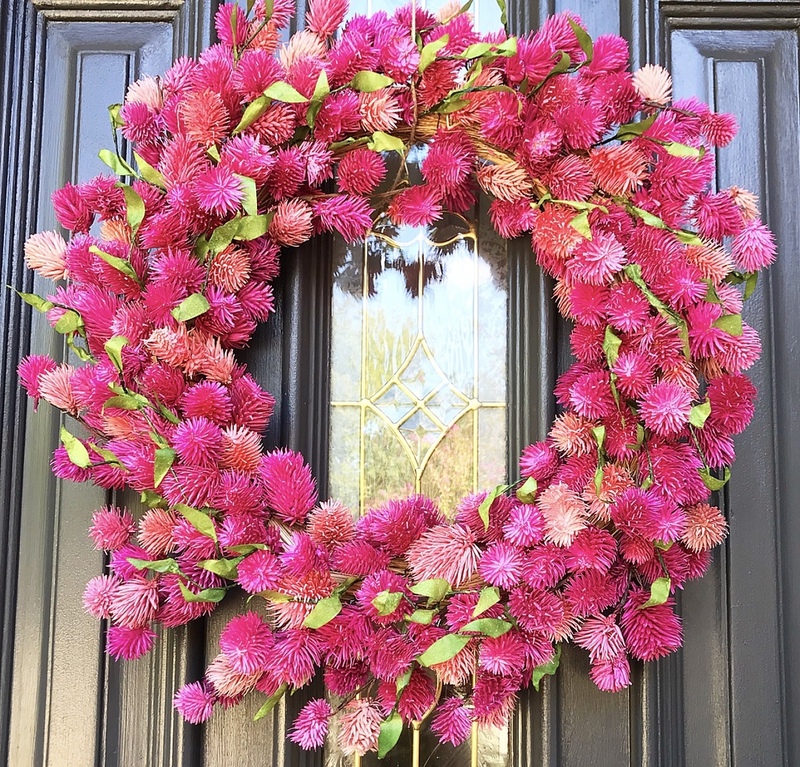 This little wreath was the inspiration for my porch! The inside of my home is filled with whites, woods and more traditional fall colors, so I LOVED this mix of pinks for something different! 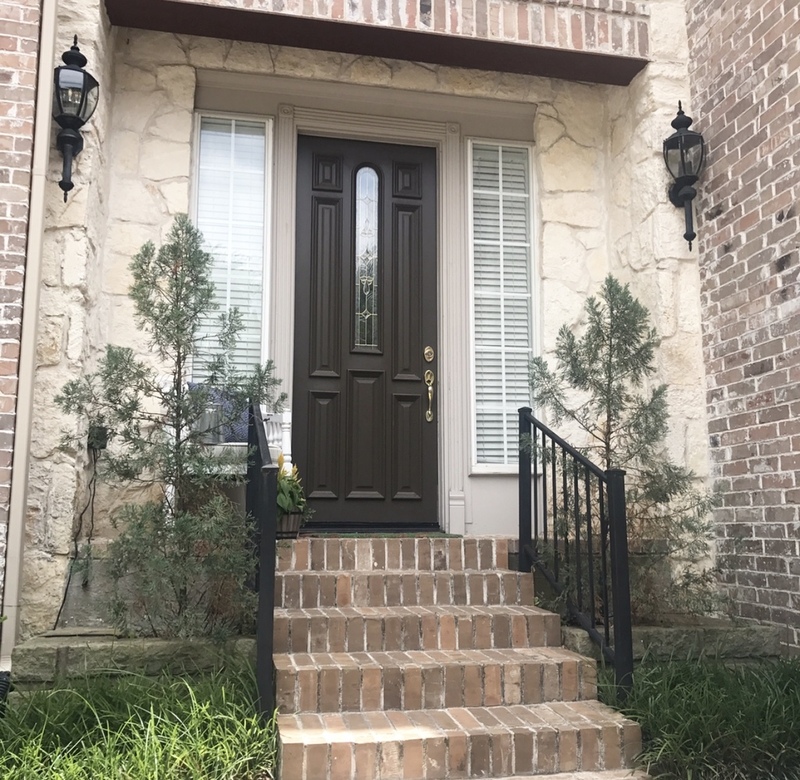 It really pops against the black door and at the risk of sounding weird….it totally reminds me of, “Horton Hears a Who.” Do you remember that Dr. Suess book?!? I feel like the flowers look very similar to the flower Horton the Elephant carries around as he tries to help the Whos! “A person’s a person, no matter how small!”…and once I got that thought in my head, I loved it even more! Haha! You can find my Who Wreath here. 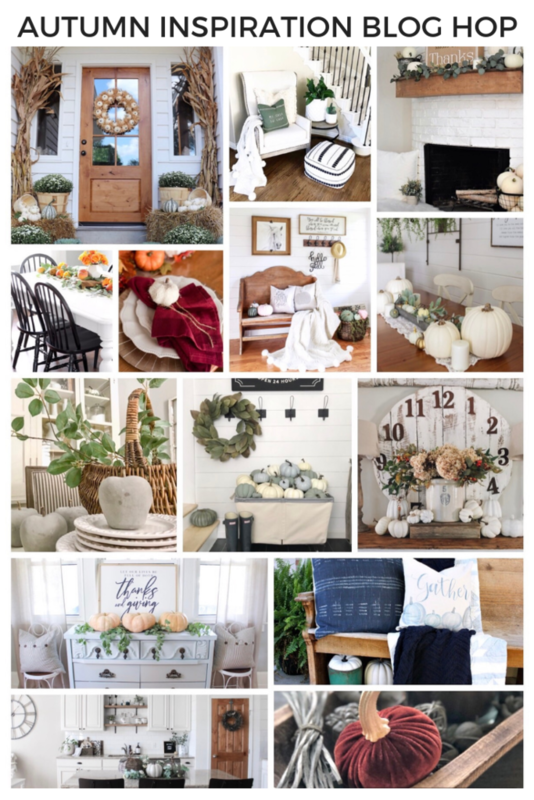 Here are a few other door decor options that would add some Fall fun to your door! That’s a given, right?! Real or faux, you need at least a couple! Our stores JUST got real pumpkins, and it made me SO happy to see! Hundreds of these baby boos were piled up at our Calloways yesterday! 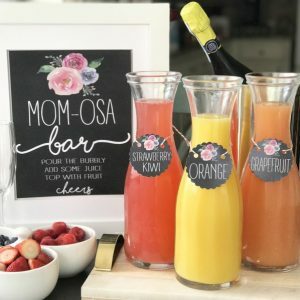 However, when I went to decorate this space I could not find any color except orange, so I decided to bust out the brush and acrylic paint and go to work! 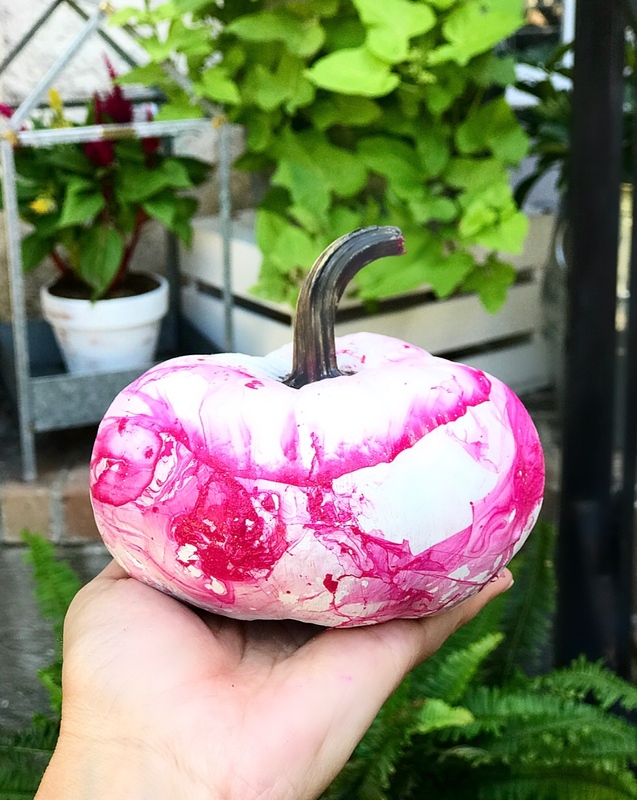 My original plan was to do all the pumpkins with this marbeling technique that uses water and nail polish, but…..this was a bit of a pinterest FAIL! This one looks just ok, but I ended up painting over the others I did with white. I’m not sure if it was the temperature of may water or something with the type of nail polish I chose, but it just did not go as planned! I was also out of gloves and thought, “eh, it will be fine.” WRONG! Insert me scrubbing my skin raw to get the nail polish off….haha! You win some, you lose some. Whether you paint or not, a few tips for making your real pumpkins last longer! 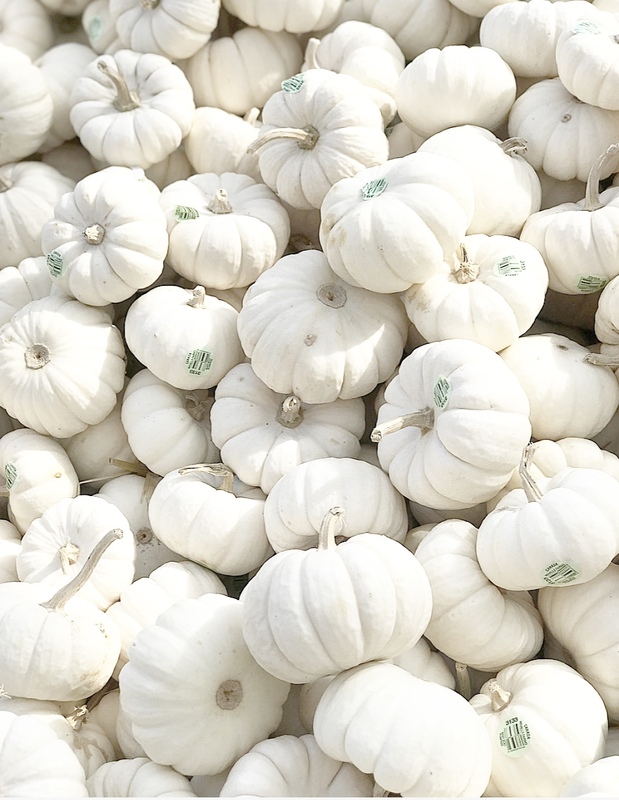 When you first get your pumpkins, mix together water (enough for pumpkins to be able to soak), 2 teaspoons of bleach and a squirt of dish soap. You can do this in a bathtub or your kitchen sink. Let them soak for 15-30 minutes, rinse and dry well! It also helps to spray them with a clear coat of sealer. I used this one. If you are going to paint, I would definitely recommend making this a must before and after you paint. Otherwise the paint tends to flake off very quickly. I bought these pumpkins the first part of September and using these steps, expect them to last until Thanksgiving! 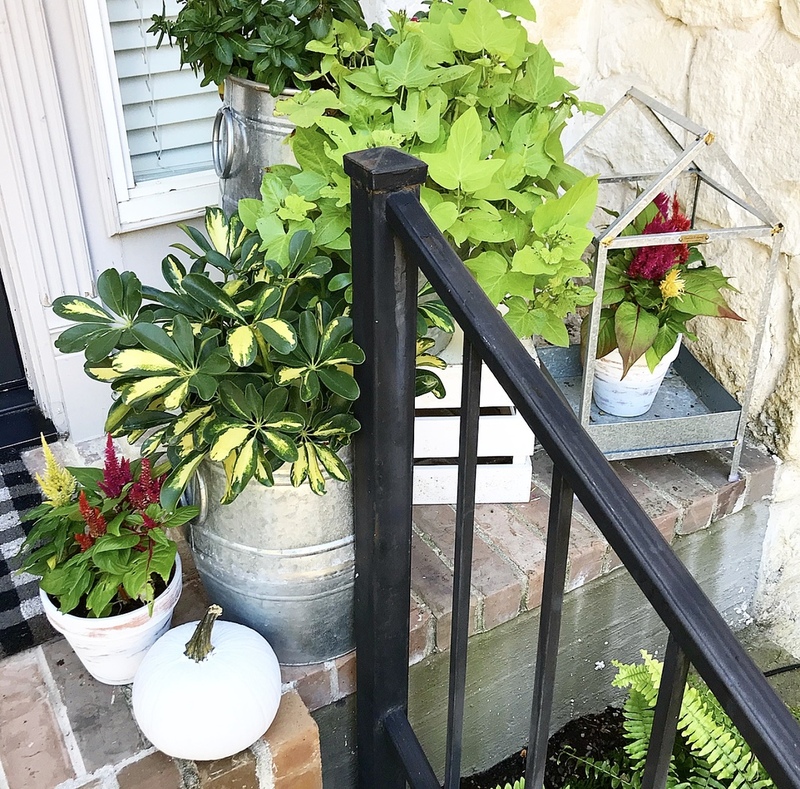 I shared on my porch perk up post that I spent a little more time asking questions and researching the plants I purchased. I am happy to report that it has been about six weeks and they are ALL still alive and thriving! I have the brownest thumb, so for me, that is HUGE! Since these guys are still going strong, I only decided to add some celosia, which looked similar to the flowers on my wreath, and a couple of small mums. It is still too early for many of the mums around here to be fully bloomed, but I might have to purchases a few later in the season. They are my favorite!! When you go to your local nursery or home improvement store, just be sure to read details about the plants you want to purchase, how much light and water they require, etc. and be realistic about your level of commitment! Stinks to waste money on plants that don’t even make it through a season! Planters make such a huge difference! Find ones that work to scale with the size of your porch and door. I ordered this set from Amazon and since they were so similar in height, I set one on a wooden crate to create a bigger difference in height. My hubby drilled holes to allow water to drain. 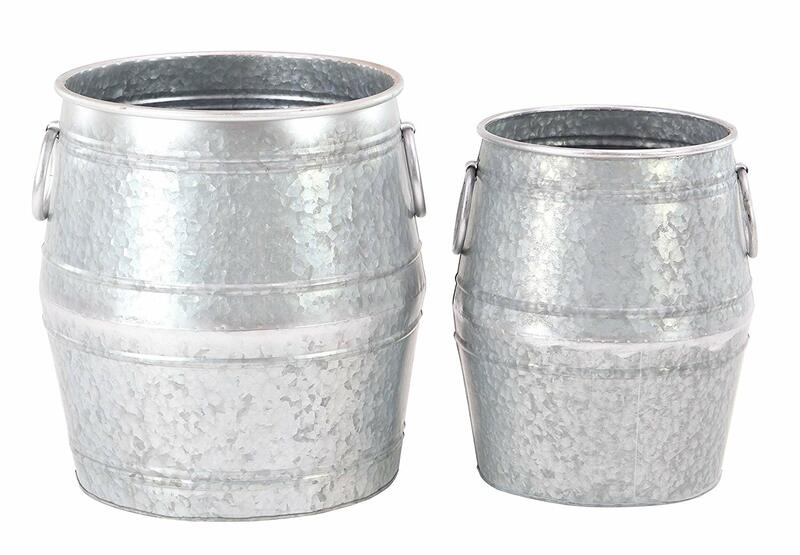 They are solid and sturdy, and would be great for uses indoor or out. 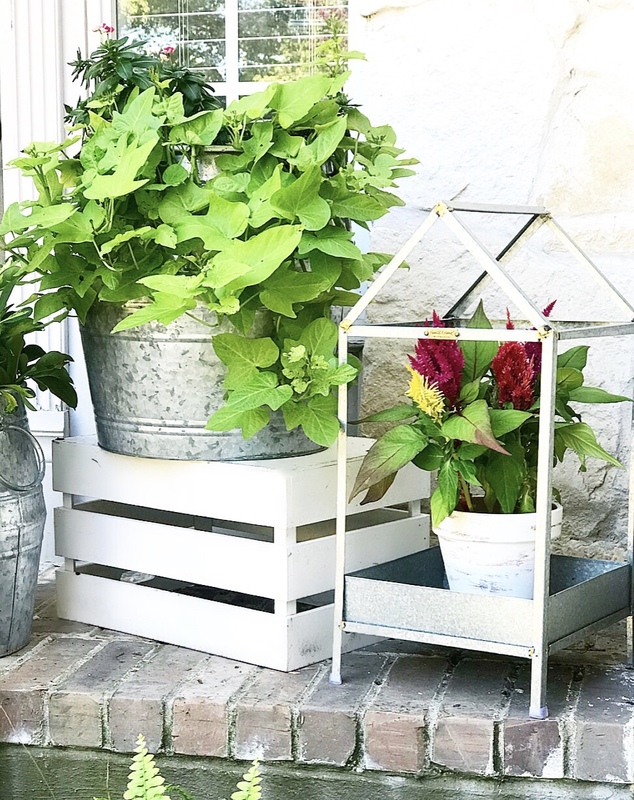 This large galvanized lantern was also a pretty addition and comes in several sizes! You can find it here. And these smaller galvanized lanterns were under $10 at Walmart. They are not currently online, but check your stores! They are a great size and quality for the price! I put plants in mine, but led candles would be pretty too! 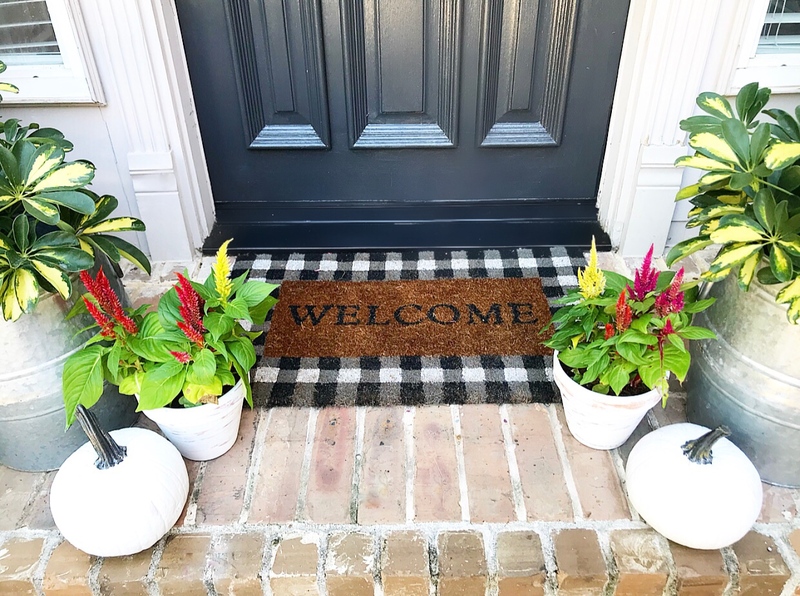 Depending on the size of your porch, adding lanterns, stools, benches, chairs, seasonal pillows, a fun welcome mat and signs can help create a festive welcome for everyone who comes to your door! When you open our front door the first things you see is a small foyer and this little nook by the stairs. I made this space ready for fall by adding some texture with the pillows, pom pom blanket (my fave!) and this pouf! 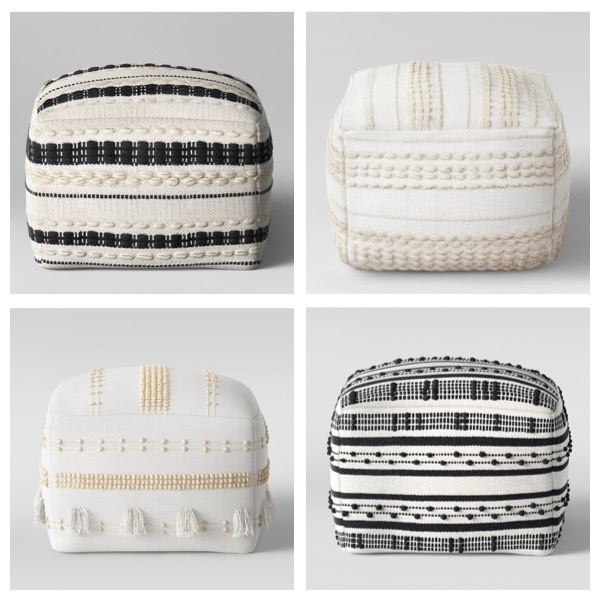 These poufs are a great way to add cozy texture to your home. They come in 6 color options and are under $50. Adding texture and coziness with pillows and throws is always an easy way to make your home ready for Fall! Thank you SO much for stopping by! 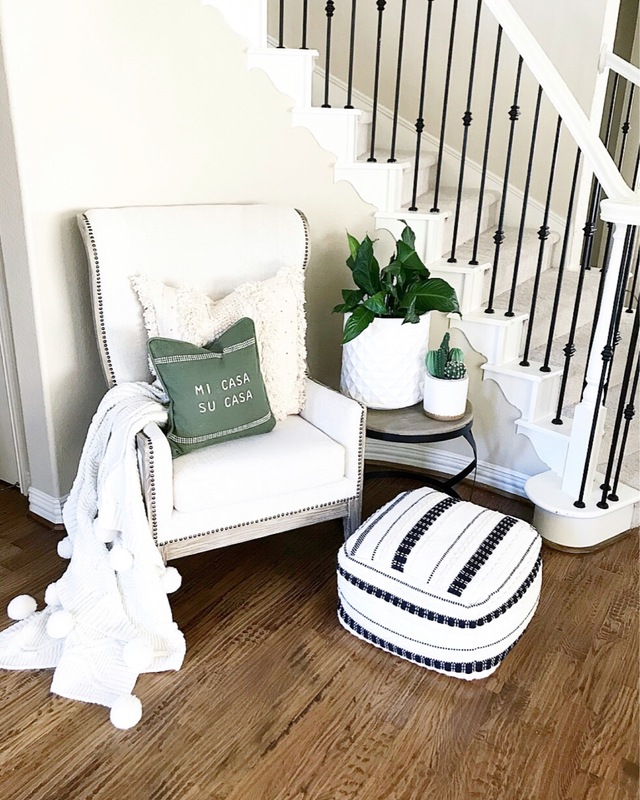 Be sure to head to Rachel’s blog, Joyful Derivatives, next to check our her cozy fall living room! And of course, stop by all these ladies’ beautiful homes! 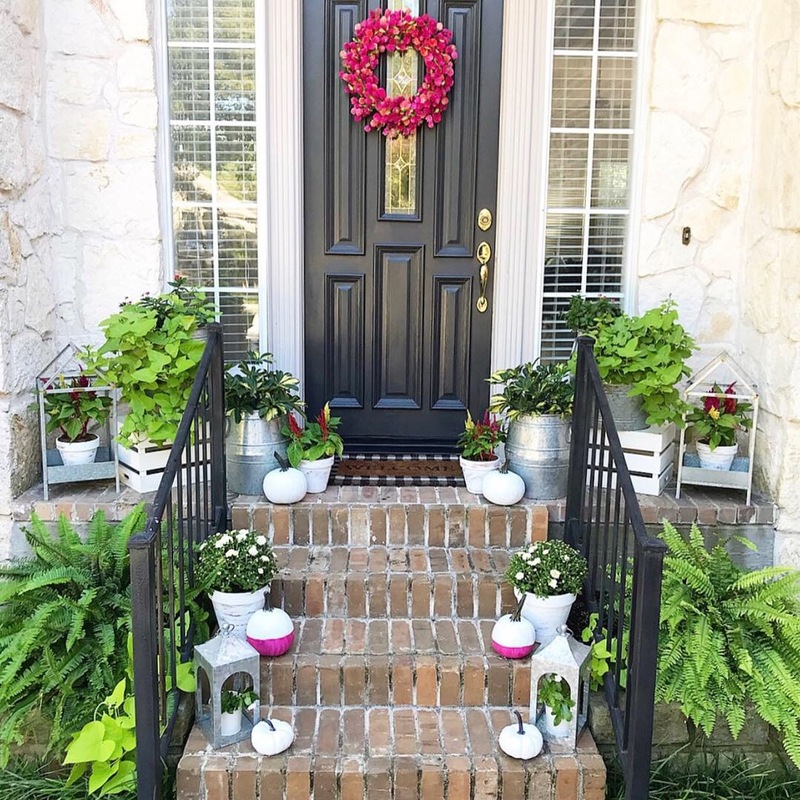 What a beautiful porch Bethany! I love your new plants, such a pretty facelift. Great tips about making pumpkins last too, I never would have thought of that. So excited for fall! I would love walking up to this beautiful front door, what a welcoming porch you’ve created for Fall. And truly appreciate all of your tips and tricks you’ve shared. It’s a joy to join alongside you on this tour my friend. Bethany I adore that pop of pink!! It is so creative!! Thanks so much! Wanted to do something different out here! Bethany your porch and entry is just beutiful! I am also so thankful for the tips and helping make pumpkins last longer. SO awesome! Loved touring with you! Thank you sweet Kelly! I hate when my pumpkins don’t make it to November! I love your beautiful porch, Bethany! 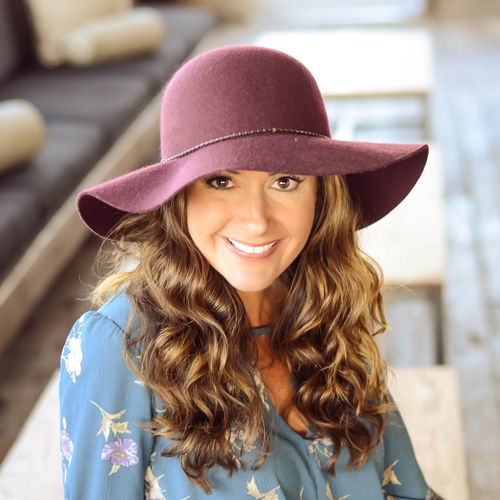 Your fall touches are perfect!! Thanks so much for sharing the tip on how to make pumpkins last. I had no idea! So happy to join you on this tour.